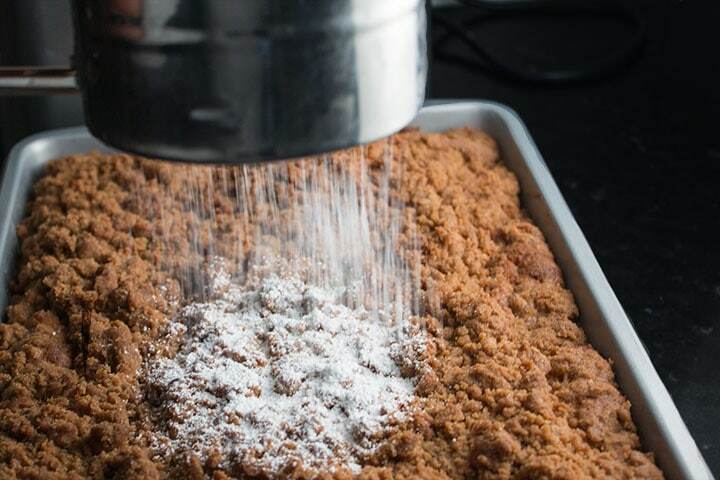 Classic Crumb Cake Just Like The Kind You Would Find In Your Favorite New Jersey Bakery. A Tender Cake Topped big, delicious chunks of Cinnamon Sugar Goodness! 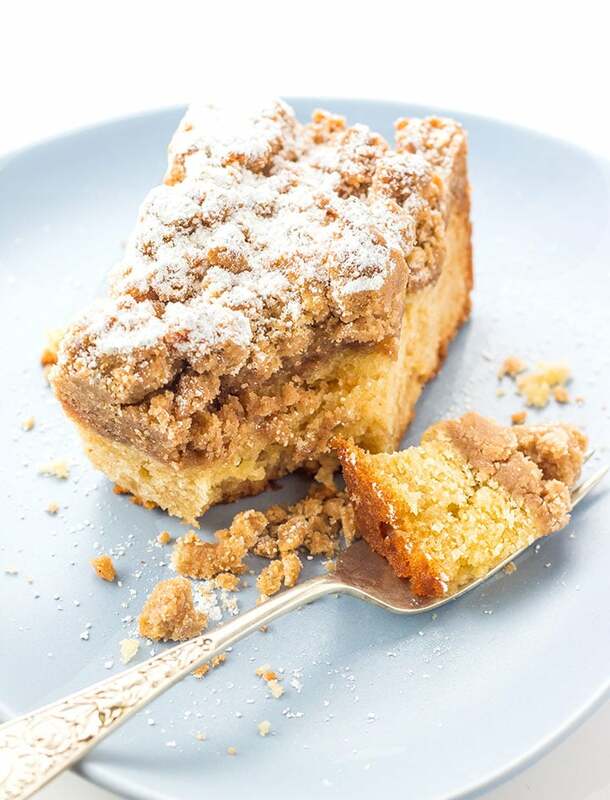 This recipe for New Jersey Crumb Coffee Cake makes an incredibly moist cake with an extra thick cinnamon, sugar & butter crumb topping – just like you find in New Jersey bakeries. 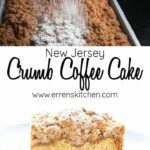 Growing up in n New Jersey, I grew up on cakes like Entenmann’s Crumb Coffee Cake (an all-time favorite of mine) and Crumb buns from the local bakery. I have a weakness for anything with a crumb topping. On Sunday mornings, my parents always had fresh crumb cake and donuts from the bakery. The best was when it would still be warm! Food can really remind you of home, but Crumb Cake isn’t known in England so I haven’t had it in years. 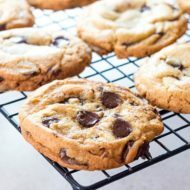 This blog is inspiring me to try to recreate my most loved foods from back home and the good news is – this Jersey Girl can bake! This is my version of the Entenmann’s cake. 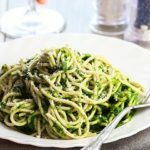 Creating this recipe took me several attempts. Before now, it never turned out quite right, but I have finally perfected it and I am more than happy to post it for all of you. The base is lovely and moist and I created a really thick crispy crumb topping (I have waited years for that topping). It’s so thick that for some it may be a little too thick. If it looks that way in the picture, you can cut the topping recipe by a quarter, but to me, the topping is the best part and It is to die for! 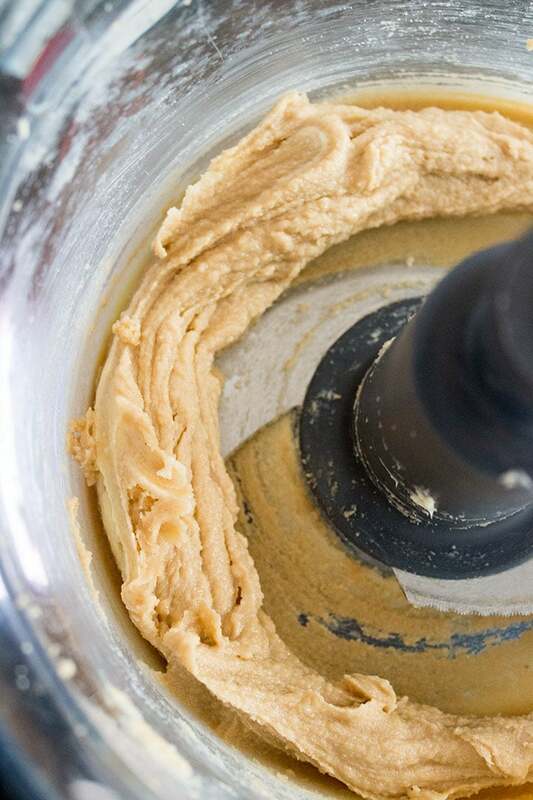 Start with making the topping by mixing both brown and white sugars, cinnamon, and salt in medium mixing bowl. Add the warm melted butter and stir to blend. 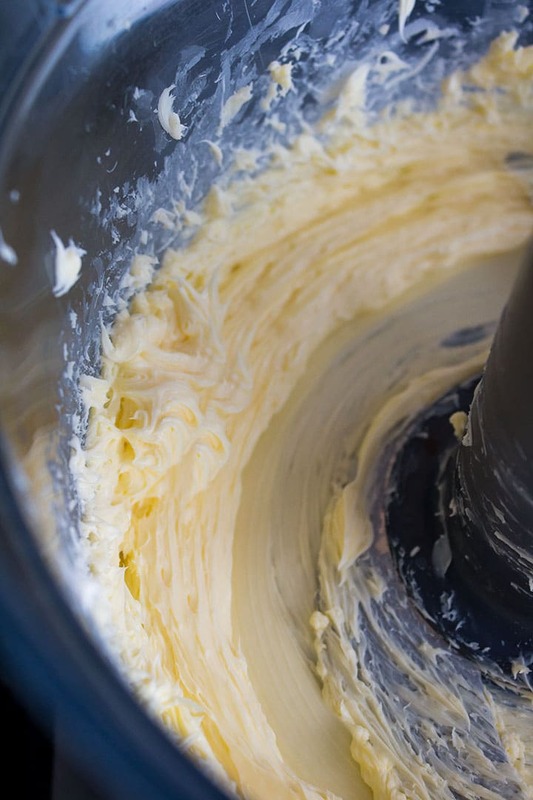 Add flour and mix with a fork until moist clumps form. 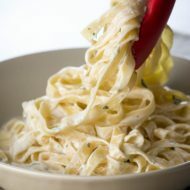 Squeeze a handful of the topping into your hand, if it doesn’t clump together, add some more melted butter until it does. Set aside while preparing the cake. 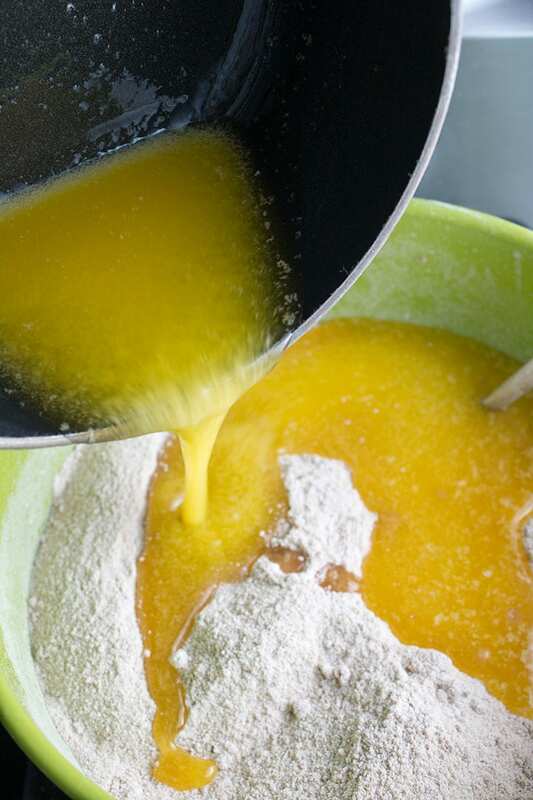 In a medium mixing bowl mix together the flour, baking soda, baking powder, and salt. Beat the softened butter in large bowl until light. 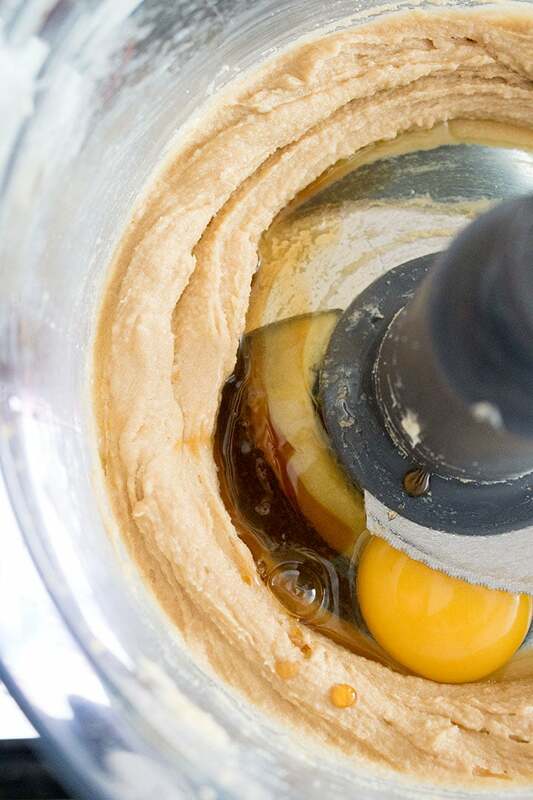 Add buttermilk and vanilla, beat just until blended. 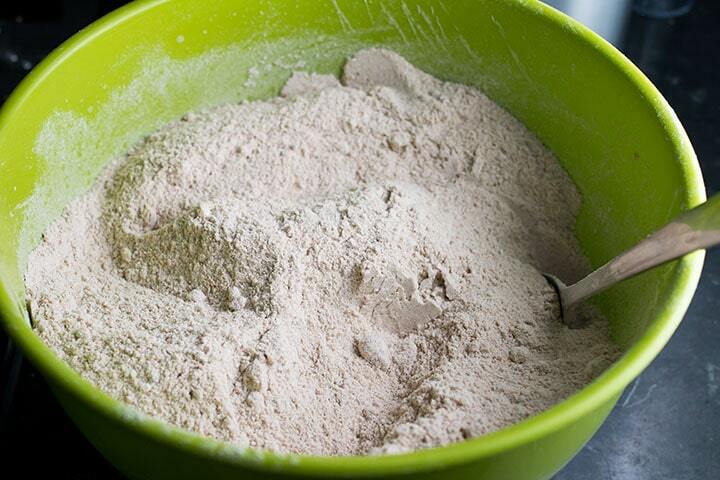 Add flour mixture in 3 additions, beating just until blended after each addition. Hand- squeeze small handfuls of topping together to form small clumps. 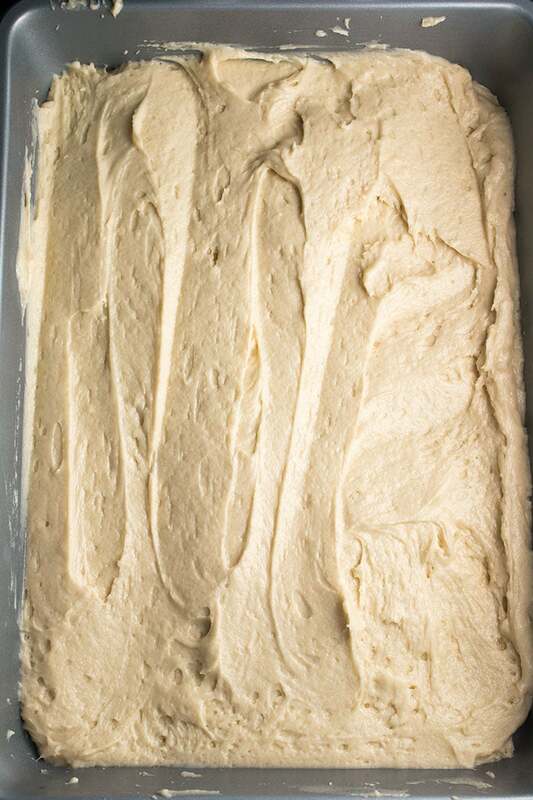 Drop topping clumps evenly over cake batter, covering with a thick layer of topping. Bake 1 hour or until the tester comes out clean and topping is deep golden brown and a little crisp. Cool cake in dish on rack at least 30 minutes. Dust with powdered sugar. 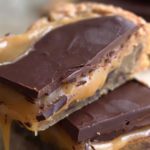 Cut into squares to serve and enjoy every last bite. 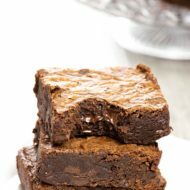 If you have trouble with the topping sinking into the cake, try adding a ½ teaspoon of baking powder to the into the flour in the topping. 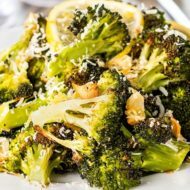 Just keep in mind that this also causes extra browning so it may cause an extra crispy crumb. Add flour and mix with a fork until moist clumps form. 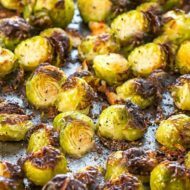 Squeeze a handful of the topping into your hand, if it doesn't clump together, add some more melted butter until it does. Set aside. 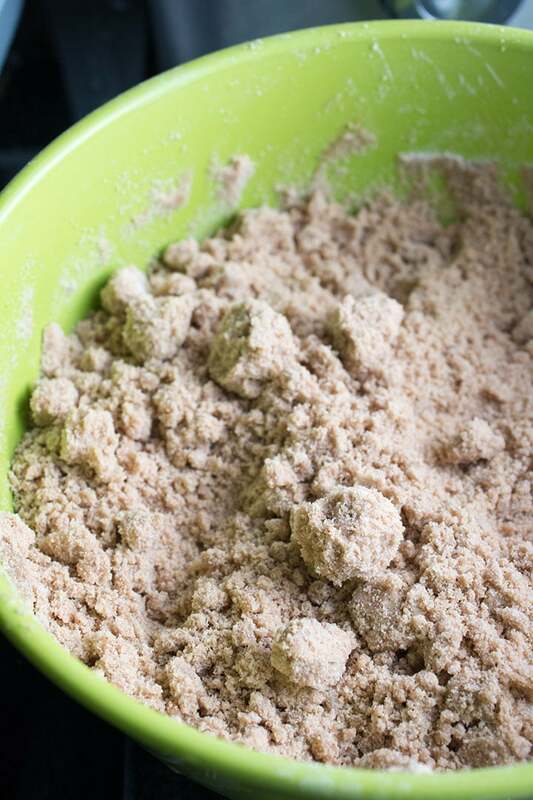 In a medium mixing bowl mix together the flour, baking soda, baking powder, and salt. Hand-squeeze small handfuls of topping together to form small clumps. Drop topping clumps evenly over cake batter, covering with a thick layer of topping. Cool cake in dish on rack at least 30 minutes. Dust with powdered sugar and cut into squares to serve. Update Notes: This post was originally published in July of 2014, but was republished with new photos, step by step instructions, and tips in February 2018. Being from New Jersey myself I can honestly say nobody makes crumb cake like they do in Jersey. 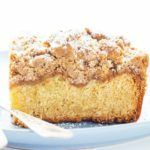 Have not been able to find Entenmann’s coffee cake which is one of my favorites so I found this website and have to say have tried several recipes and have not been disappointed. This did not disappoint. In a recent trip back east went to The cake boss bakery sorry not coming to mind what it’s called but the crumb cake was absolutely to die for and this one to me was every bit as good. 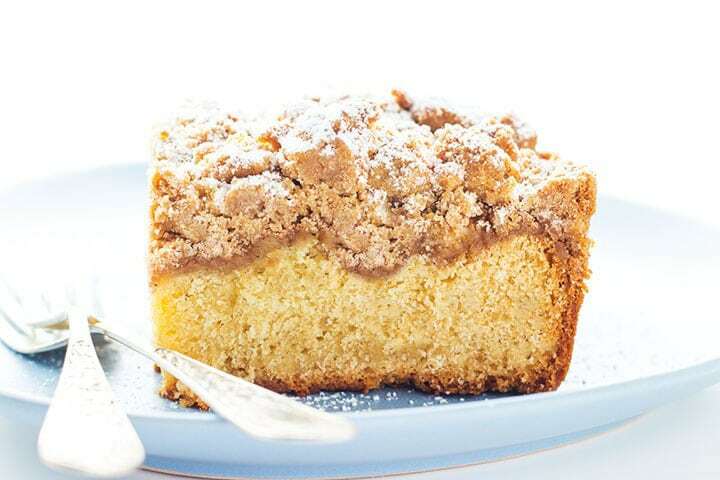 If anybody out there knows where you can buy Entenmann’s crumb cake in Tucson Arizona please give a shout out. They used to sell it but I have not found it for years. Wow Debi, I don’t know how this comment got missed! 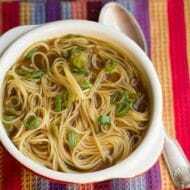 I’m so glad to hear you enjoyed the recipe!Thanks for taking the time to let me know! I made it, and it was very good. The husband enjoyed it. However, i think i may have overbaked it a little. Tge crumb topping was very crispy and crunchy, not soft and falling-apart-when-you-bite-into-it. Is there something i could do to make it less crunchy? I’m glad you enjoyed it. For a less crunchy topping, you can try cutting the butter into the flour like you would in a pie crust or a scone instead of melting it. I’m going to do a test run of this myself, but may not be for a few weeks. Let’s keep each other posted. Thank you for your prompt and helpful replies! And for including me in your experiments (keeping each other posted, haha). I wont be able to make another for a few weeks myself (yay roadtrips), but when i do end up inevitability baking it again, i may try that. I also saw somewhere in the post you had commented that you can cover the cake with foil for the first half of baking; would that help with the crunchiness? Thank you! 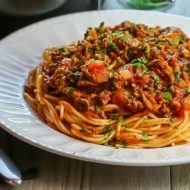 I’m all about making my recipes the best they could be! My husband is in love with crumb cake, so ive been looking for a recipe that sounds and looks good. I think ill try this one, since you say its just like NJ, and we live in PA (close enough, right??) and i really like how it looks in your photos. The 3 cups of flour for the topping is correct, right? I read it and thought “no way, 3 cups is a heckload” but hey, if the recipe creator says so, then so it is. Am saving this recipe, and will try to remember to report back!! Hi SweetPea, yes. 3 cups. My cake has a extra thick layer if crumb. If that’s not your thing, feel free to half the recipe. Hope you like it! This cake was AMAZING for our brunch last Sunday! Thanks so much! So great to hear, Donna! It’s a favorite of mine too! I usually buy the pieces of coffee cake and lemon pound cake from ☆$’s (starbucks) very spendy and usually dry. Used to get the ettemans (?) brand stuff in oregon and see it here in Alaska to. Not sure what it is but know brand. 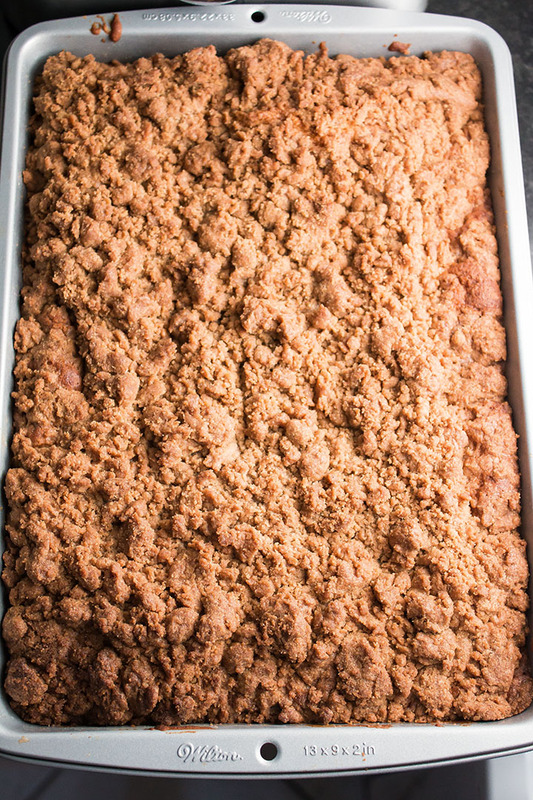 1- I love muffins with crumbling crumb topping (pumpkin muffin and apple pie muffin as well as apple pie) so I plan on trying this crumb topping on muffins. 2- I am sure there is a way but I’m not good with measurements as I learned to cook by just “eyeballing” it. But I have seen a lot of recipes posted lately where you could make single serve cakes in coffee mugs in microwave oven. This would be REALLY great if anyone has such talent. My mouth is really watering now. With many health issues that I have ( having 4th surgery in few weeks in matter of 5 months) I’m not up much. Hubby just been having medical issues to. So no more big cakes or cookies. 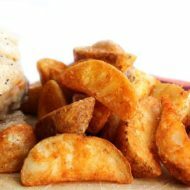 If we get craving I’ll take few premade dough drops and cook in toaster oven. 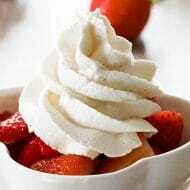 So doing this will help with sweet tooth but also help cut down from eatting a whole cake. Also has anyone tried coconut oil for butter, to make little healthier? Tried it and the crumb topping disappeared? It looks like a yellow cake. Any idea why? Hi Michele, I’m so sorry to hear it! I’ve had others say the same, but most say it worked perfectly. 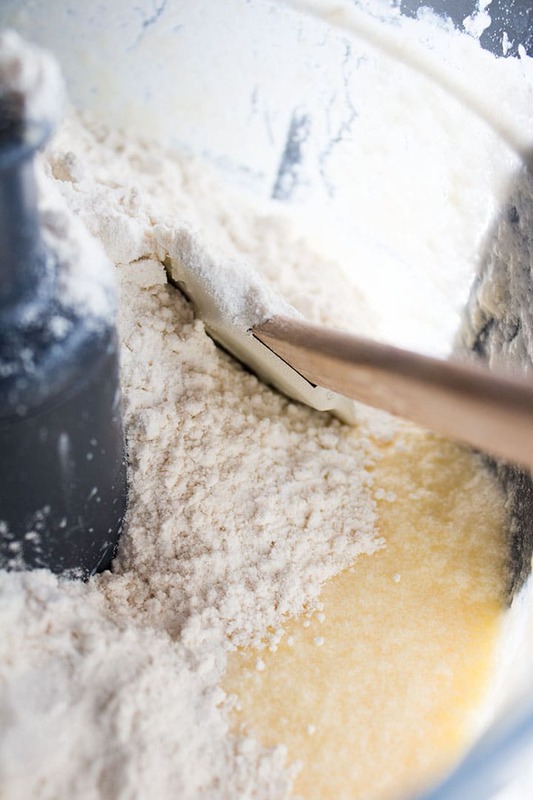 It could be the flour you used (they’re not all created equal). I’ve made this cake more than any other cake (it’s a family favorite). What I suggest is try cutting the crumb topping in half and adding a teaspoon of baking powder to the mixture. It helps to keep it from sinking into the cake. 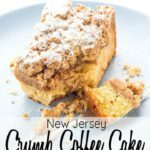 I LOVE YOU FOR POSTING THIS NEW JERSEY CRUMB COFFEE CAKE. THANKS, ERREN!!! my obsession is answered. Yes, Entemann’s everything! I grew up in NJ and miss the food there SO much. My Dad used to love Entenmann’s coffee cake and it was always a treat when we got this. 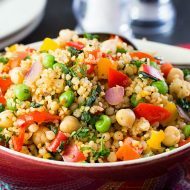 Saving this recipe to try for when I need a taste of home. Thanks for sharing! 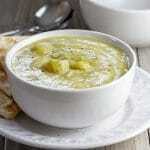 Hi Erren, Thanks for an amazing recipe. 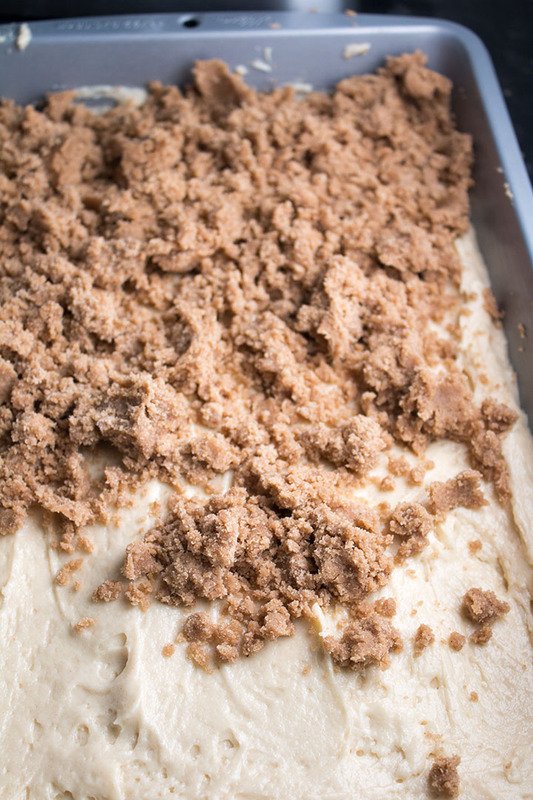 The best crumb cake on the northeast! My crumbs also sunk into the middle each time I have made this cake…..I was totally stressed about it,reworked baking it a bit before adding the crumbs but still sunk. I made it for a tailgate party after the reworking, and was going to leave my crumb cake at home till my husband said no way bring it, it’s delicious. WELL…..I was called a genius for putting the crumbs in the middle, so much better then losing half the crumbs to the ground, because anyone who has ever had NY/NJ crumb cake knows the crumbs are the best part. So a big thank you for the amazing recipe!!! Hi Carrie, I was thinking that maybe it’s the American flour compared to the flour here in the UK. I’ve heard they are different. I’ll let you know if I can get one of my friends back home to experiment with me and test out how to get the crumbs to stay where they should (most of them anyway! I’ll let you know.